DHO's Blog "The Good, The Dad, and The Ugly"
A Positive Message or an Attack on Men? If you read the news or participate in social media, you have no doubt seen the phrase "toxic masculinity." If you haven't, the concept is simple on the face of it: behaviors and expectations of what a "real man" is that cause or increase likelihood of harm for self and/or others. The is an ad produced by Gillette that has taken the internet and news media by storm in the last two days that attempts to highlight "toxic masculinity." Here's the rub: what the hell does that mean? Why do we even care? Boys or girls, biological, step or adopted, uncle, grandpa or just mentorship-related; we influence children and adults through our interactions and through our value systems. These value systems are held in close connection to our self identification. We define ourselves through our values, and our values should influence our actions. As we hold these values so closely, we tend to try and pass them on to others. If the values have served us well (or more accurately, when we perceive that the values have a positive influence on our lives) we want share our beliefs so others can have our success. What if our values are actually holding us back or causing other harm? That is the reason why we should care about this "toxic masculinity" discussion. It is far too complicated cover all of this in a single post, but lets take a quick look at what is going on in this ad and what we can do; perhaps more importantly - should we do anything? In the last two days, my news feed has been swamped by reports and discussion on this advertisement by Gillette (a company that makes razors and other personal care products for both men and women) which "calls out" the "toxic" behaviors of men. I suggest you watch it for context for the rest of this post. The comments on the video are quite "enlightening" as well. Wade into the comments with care - they are not known for their "depth" but they give a good reading on a commentators emotional state at the time. The initial gut reactions are telling. Large numbers of men feel attacked and respond negatively. Why wouldn't they? The question is: Are the feelings justified? Hell of a question, isn't it? I will take a stab at, though. Think of belief and action systems that are often held up as "good and virtuous" or as the highest forms of "masculinity": a "classic/old school gentleman," the "chivalrous knight," or the "hardworking father." All of these share common threads - responsibility & bravery among them. Think of the actions and believes these archetypes, the typical example of a thing, tend to have: kindness and consideration to others, forgiveness, mentorship/leadership, resoluteness, protectiveness, and strength in the face of adversity. (Disagree? Feel free to say so in the comments!) Each of these requires one to have both a sense of responsibility to act and bravery in order to live up to these concepts. With this idea of "masculinity" in mind, does the commercial attack those things? Spoiler alert: no. The ad doesn't attack any of these concepts; rather it highlights and encourages these concepts. I am thinking of breaking it down scene by scene but that a bit long for today - let me know if you would be interested in more commentary on this ad. So if the ad was mostly positive, why so much backlash? I can identify nearly every scene, but the one that stood out the most for me was the scene with the two boys 30 seconds into the ad. The narrator says "making the same old excuses" and the video cuts to two young boys "fighting" (more on that in a moment), then the dads standing idly by the grill repeating "boys will be boys" over and over again. The narrator continues, "but something finally changed," and a news caster talks about accusations of sexual assault. It was at this point that I had my negative emotions. The preceding scenes made me sad - bullying, sexual harassment, party culture, the "sitcom dad" attacking the maid, the board room guy using power and authority to silence the woman and "assume" her thoughts - these are situations that I believe represent harmful beliefs and actions. I was on board and supporting the message thus far; there are elements in our culture (and specifically in the culture of men) that are wrong and need to be confronted. The scene, unlike the rest, lacked clarity. We see the two boys, of similar size and age, start to tussle. No context. Just a yell and down they go. From my perspective, I see two "boys being boys." To me, that is a thing - my sons like to wrestle with each other. They love to wrestle with their dad! This sort of play is not negative or "toxic," not any more than baby chimps or lion cubs tussling in nature. It gives an opportunity for my children to play and discover things, learn lessons, and connect with each other. Such play fighting or sport cannot be the entirety of a persons existence, as that would have a negative effect for sure, but in measured amounts, it serves to be a teaching tool; teaching about self, others and the world. A child has a toolbox of skills they can use solve conflict. The younger one is, the far fewer the available tools. One of the earliest tools is physical action. That physical action can take many forms: one could walk away, one could sit still, or one could attack another. The youngest attacks his brother on a regular basis, as the oldest is quite astute in driving the little one to "madness." And generally, I let them fight. Why? It teaches them something. I am not completely laissez faire a la "Lord of the Flies" - I am monitoring my children. I am not stepping in right away though. If I step in EVERY TIME they have a physical confrontation my sons learn one thing: if we fight a parent will stop us. While this seems like a good lesson, but is it? To stop every fight at the earliest sign of conflict prevents them from exploring conflict resolution in a most critical situation - after violence has started. What happens when we apply this to the larger world, where there are no parents to step in at all times? My sons do NOT learn to avoid physical confrontation, the learn to avoid getting caught. They do NOT learn that physical solutions often extract more in cost than in reward, only that violence will make parents become involved. They do NOT learn how to de-escalate violence or violent action, they learn others will de-escalate the situation for them. They might never learn there ARE times when violence is necessary, and that even in those cases, there is a cost. By allowing them to fight (supervised) they are actually developing their ability to make judgments and to reach agreements. They learn (the eldest already knows, as he does it on purpose) that you CAN push someone to violence through non-violence. There is a level of teasing, harassment, or just plain "button pushing" that will make violence justified in the mind of another. That is not the same thing as saying the justice is justified - only that it becomes justified to the other person. That is a VERY important lesson. It re-enforces civility and respect. They also learn that violence has consequences. Not just physically, though physical consequences have occurred; bruises, scrapes, bumps and cuts have all happened. More often than not the consequence is social, not physical. It could be a consequence within their relationship; they are far less likely to participate with one another after a significant fight. Less likely to share both physical possessions and knowledge. They are less likely to be trusted. It causes all sorts of problems. I notice the fight and I remember for the next time they ask me for something and then I remind them that those that fight do not get rewards. All of this helps teach that violence has long term consequences. I have heard people say " no violence is justified," and I completely disagree. There are times when extreme violence is justified: self defense and the defense of others being the central pillar of that belief. More importantly, there is "unjustified" violence, and I think that was what Gillette was trying to highlight in their advertisement. They just did it poorly - there are time of justified violence and without context it is impossible to determine if this either of the cases. Indiscriminate violence is bad, we can all agree. Some violence might be justifiable - but how do we learn that? Through conflict as a child TEMPERED by the guidance and wisdom of adults. Interaction is key - to never intervene is tantamount to abuse, but some risk must be taken in order to allow experiences to happen. Once those experiences happen, it is our responsibility to provide context beyond the immediate situation so that they can learn to apply the experience to the larger world. Where else can we see justified violence? In sports. In many ways sports are the way in which modern societies find a way to allow physical action to manifest itself in a positive manner. Extreme examples are the martial arts (MMA, Boxing, Karate), less extreme is football, wrestling or rugby, but these are violence, make no mistake about it. What makes these justified vs unjustified violence? Agree upon rules and consent to engage in the activity. That is the lessons we need to teach, and by having "zero tolerance" for all physical violence we take away the ability to have learning experiences. Without these experiences (and the guidance from our role models) we cannot understand the world and how we should interact in it. Gillette Actually Gets it Right - They just did it Wrong. A minute later we see the resolution of the fight - the dad steps in and says "that's not how we treat each other, okay?" Small problem, i can hear the kids giggling. Maybe that's my subconscious hearing what I want to hear, but I don't hear complaints, screams or protest. I hear two kids having fun in a physical way. Two boys being boys. That's what touched the nerve. I won't lie, it took some introspection to fully understand the "simple" feeling of anger at this scene. It takes introspection and self reflection to unpack all of that. Going though the exercise is good and has allowed me to better grasp concepts I am teaching to my children. If Gillette wanted the ad to be a conversation piece, they have succeeded. Overall, the message is positive and one that dads can support. Kindness and consideration to others, forgiveness, mentorship/leadership, resoluteness, protectiveness, and strength in the face of adversity. Each scene in the ad highlights at least one of these concepts as being positive (or conversely, a scene shows that lacking these virtues leads to negative results) and that is a huge takeaway. Is that the only takeaway? The idea that some ways of acting are bad? Hardly. To me there is a much larger message that is getting ignored in this discussion of outrage - positive male role models are critical to the development of strong men. That's for a different post though. Let me know in the comments below what virtues you are teaching your children or mentorees; or let me know if you think the commercial was actually an attack and where it went wrong. When you hear someone say, "We're Homeschooling our child," what images go through your head? For me it was kids running around in homespun clothes, eating organic oatmeal out of hand-carved bowls. But upon further inspection, I realized homeschooling is an option that fit our situation perfectly for our family, and we didn’t have to learn how to operate a loom or anything! A little background on me first. I was 56 when I left the workforce consisting of 3 different careers (Military, Restaurant Management, and Radio Production) and my wife became a Nurse Practitioner. Our daughter was entering the 2nd Grade in a school system that was below average on many levels. Good friends of ours were homeschooling their 4 kids and showed us how simple it is to get started. I have the temperament and patience to be a teacher (I had often thought of becoming one) and now I had the time to do it! In many states there are just a few rules or guidelines, this site is a good source to learn about your state. : https://hslda.org/content/laws/ In my state, Tennessee, the main requirements are 4 hours a day for 180 days a year. More on that in a minute. Most states require that you become a member of some sort of umbrella organization that reports attendance and grades to your local school board. These can vary from stand-alone organizations to church groups and the like. For a nominal fee, membership allows you to obtain the next step: Curriculum. Sounds daunting, but really simple, "curriculum" is what your child will be studying. There is a plethora of curriculums available from Kindergarten to High School provided by your umbrella organization, or from numerous agencies and companies. A quick Google search will give you a good start. I chose Veritas Press for most of the subjects I teach; Math, English, and Spelling. Now that on itself is simple to follow, but the real joy, and source of so much flexibility, is the 4 hours a day/180 days a year requirement. It can be any four hours, consecutively, broken up, at any time. Is your child into sports? Practice and games count towards those four hours. Shopping with the kiddos at Walmart? Have them add up the total, guess what, that counts! Go to Sunday school?...that counts too! There is soo much we do that can count towards the school day. It's the flexibility that has proven to be the so gratifying as a parent. You don't need school uniforms, I call our school PJ Academy because that's our school uniform, there are no In-Service days, you can pick your vacations and time off. No need for Doctors notes and there are no fundraising candy, wrapping paper or lawn chairs to sell!! And the very best part of it all? Spending quality time with your kids! There is nothing so rewarding than to see an alien concept (Math or Adjectives) being understood by your child!! You can decide what and how your child is taught. You are in control. Is that to say you can skip math altogether, teach Zorastic Fundamentalism instead of science… No. Keep in mind that as long as you stay at or above the minimum requirements for the state, you good to go. Working with your umbrella organization will get you started in the right direction. In future articles, I will discuss the issues brought up by the naysayers...OOhhh your child will never be socialized....What about standardized tests?.... What about team sports? I will happily cover those topics soon! All in good time, all in good time. Addresses. When is the last time you thought about your address? How about all you addresses for the last 3 years? Five years? TEN YEARS? I have. Especially in the last few hours... the background check I am filling out wants every address I have lived at for the last 10 years AND someone who can verify that I lived there. Luckily, I have a folder. A very special folder. A folder that contains all the little tidbits of my pasts lives that I don't keep i my head any more. It's my "Occasionally Super High Important Tidbits" Folder. Yep, the "OSHIT" Folder. Aptly named as I have regularly face-palmed myself and said this aloud when trying to recall the information form memory. Professionally, I do occasional client work as a Life and Career Coach as a part time "side hustle." I used to teach transitioning skills professionally, but that opportunity has moved on, and so have I. The information and skills a received in that area are really valuable, and you see just how little people know about "looking for work." Its not their fault - looking for work is usually not something we think about as needing to have a skill in as we (hopefully) don't need to look to often. And when we do look for work, we go with "age old, tried and true wisdom" so we are all set, right? What could go wrong? Well, lots, and not being told to have an OSHIT folder is one of the many things I now coach clients on regularly. This information (addresses over the last ten, or even twenty, years) is the sort of thing you don't know you need! One of best things about being a dad is passing on lessons you have learned to the next generation. In that simple act, you give a jump start to that person, helping get them to the next level. No amount of "now, listen your old man" can replace going out and doing things on your own and learning the lessons for yourself, there are many ways to reduce time wasted and stress encountered if you only listed. What's in the Box, er, Folder? "Life is a crappy teacher. It gives the test first, then you learn the answers." So what's in the folder? Tidbits; little bits of knowledge that i have learned might be important to have in the future but are generally hard to remember and/or will be hard to find later. A perfect example is "previous home & mailing addresses." What can/should go in YOUR folder? bonus points if you have landlord contact info or someone NOT a family member that can verify you lived there. References - Keep these up to date! Because the size of this stuff is rather small my folder is actually a digital, not a physical, document. I email my self a copy each time I add something and I save a copy on my computers and back up drive (when I remember to do so...) so worse case is I might lose the most recent information (the easiest information to recollect, thankfully) so not a big deal. I use Microsoft OneNote to organize my OSHIT Folder, along with many other bits of information. It syncs between my computers, tablets, and phone. You can password protect sensitive information on OneNote, so that's a huge plus. If you aren't sure, just keep a paper copy in you safe and in an actual folder. Okay, now it's your turn! Do you have an OSHIT Folder? Do you thin its a good idea? What advice would you give that I missed? Comment below! "Now, here, you see, it takes all the running you can do, to keep in the same place." The Red Queen to Alice,Through the Looking-Glass, Lewis Carroll. Have you ever heard of "The Red Queen Hypothesis"? It states that organisms must constantly adapt and evolve in order to simply survive. This theory has been applied to areas beyond biology - business, exercise, education to name a few. It also applies to dadshideout.com and other online communities. Remember "MySpace"? When you fail to adapt to the changing conditions, you don't just stop expanding, you actually shrink until you die. It seems no one can avoid the Red Queen - DHO is no different. Unless DHO adapts to changing conditions and evolves to be a better organization, DHO will follow in the steps of Myspace. In July of this year (2018), there was a huge change here at dadshideout.com. You may not have noticed it, but the custodianship of the website changed hands. With the changing of the guard came new views and new ideas. It also came with a realization. If dadshideout.com continued on its current course, the site would be dead in a year. So come along with “The Good, The Dad, and The Ugly” as we take a look at the past, the present and the future of DHO. The current custodians are @thedakar and @xJediDadx . They are the current Head Administrators for dadshideout.com and the DHO Discord Server. Previously, @Aftrthought051 and @MagmaFlow were the lead administrators with @joey791 and @Pinmonkey001 being invaluable supporters of DHO with other administrative duties such as TeamSpeak. This team has been in place since the inception of DHO and had done a fantastic job of keeping DHO and open and welcome place for dads. Yet, 8 years after the doors of the current forum opened to its first members, the original admin team was feeling the pressure. The passion was there, but the time to devote to DHO was, understandably, waning. Action was needed. The call for volunteers went out in June of 2018. Who was willing to take the responsibility of keeping the "lights on" and be the new Admins of DHO? The responsibility is a big one. Since October of 2010, there have been over 2300 dads that have joined the ranks of DHO. Tens of thousands of posts have been written in the forums. Dozens of clans have been created with “dadshideout” or “DHO” in their titles. DHO is more than a website - it is an entire online ecosystem. It goes far beyond a gaming clan; it is a place for dads to find advice, receive mentorship, and commiserate with other dads about being a dad. With the bat signal lit, xjedidadx and thedakar threw their hats into the ring. The council of admin dads conferred - who would be the chosen ones? After much deliberation, it was decided that thedakar and xJediDadX were to be given the honor and privilege of being the new administrators. Shortly thereafter, the accounts were transferred, the passwords given, and the keys handed over. With that, DHO had two new Dads at the helm. So there you go. All done, right? In short, DHO was dying. DHO, by all metrics, has been shrinking from its peak in 2015, but the current trend was sobering. 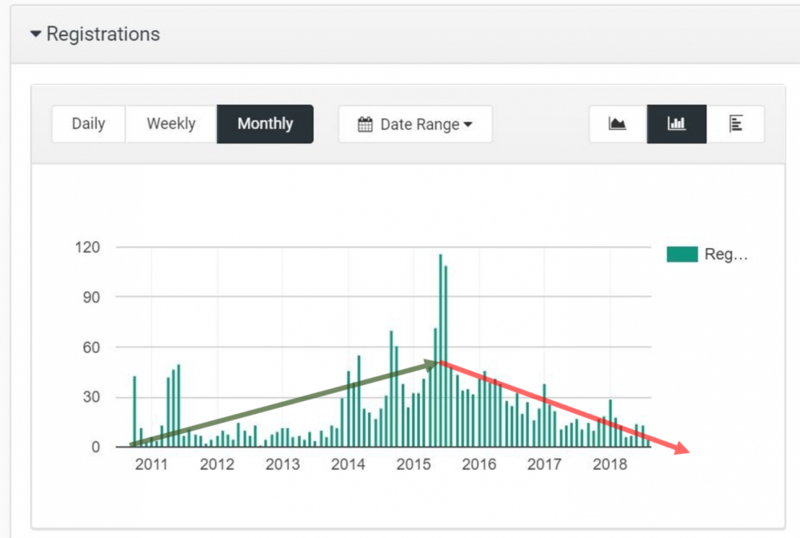 If the rate of decline continued, the site would be a ghost town within a year. With no one around, there would be no reason to spend the money keeping the site open and the legacy of DHO would disappear. So the new admins declared that something had to be done and change was coming! The old admins wished them luck and hoped for the best. The old admin team had tried to reverse the decline, so let's be clear that they are in no way to blame. Some of the long time DHO members shrugged their internet shoulders and said, “it has been tried before - good luck.” The reactions were rather lackluster - measured at best. 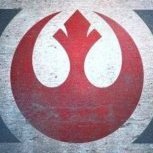 The admins were volunteers, the decline had been happening for a long time, and what could be done on a non-existent budget, anyway? The odds seemed stacked against success. In August, thedakar put out the call to form a team of DHO members. Armed with his graphs showing the declining metrics, thedakar sought to get the experience and diversity needed to look at the problem, present solutions and debate the way ahead. The team would be made of long time DHO members, more recent dads, gamer dads, non-gamer dads, and dads of all ages. A dozen of dads raised their hands and offered to take part. The team was formed to tackle the problem. The idea was simple - figure out how to revitalize DHO. The answers were far more complicated. This will be a multi-part series where we walk you through the DHO Revitalization discussion, the lessons learned AND ( most importantly ) look for your feedback on the way ahead! Stay tuned to “The Good, The Dad, and The Ugly,” to learn more about DHO and its way ahead. Hey, you! With the shirt that's all wrinkled up and billowing out like a sail in a strong wind! Want a tip on how to look good? Shirt stays, my man. Wanna look sharp? Use shirt stays. Tired of your shirt coming untucked when you sit down? Use shirt stays. Got an interview? Wearing a suit? Wanna look like a million buck? You got it - use shirt stays! Shirt stays are something I take for granted. I learned about them from the retired Marine instructor of my Junior Reserve Officer Training Course (JROTC) in high school and have used them ever since. I joined the military (shirt stays practically a must use) a short while after high school and it wasn't until I was in college at age 25 that I realized - most men don't know what a shirt stay is! These “kids” wear wearing their slacks and button shirts, but looked like they slept in what they were wearing! At first, I chalked it up to young kids not giving a “care” and moved on. It wasn’t until I was doing a panel discussion one day when a fellow male student asked me, "How do you get your shirt to stay ironed even after you sit down?" At first, I didn’t know what he was talking about. My mind digested his inquiry as literal: Silly kid, you can’t iron a shirt you are wearing… Ohhh! The light bulb went off and I realized that because of my shirt stays, every time I stood up, my shirt was instantly pulled down, removing any sign of wrinkles. “Shirt whats?” he replies. I tilt my head slightly to the side the way a dog does when it hears a strange noise. How can he not know what a shirt stay is? I pull up the cloth on the right pant leg to reveal my shirt stay. “This thing,” snapping it to emphasize the device. He shook his head left and right - he had never seen one! And thus began the teaching of the young mind on the gloriousness that is the shirt stay. Looking sharp is universally associated with competence and professionalism. Studies even show that dressing well changes the way you think - you think more abstractly and increases perspective! (https://www.psychologicalscience.org/news/minds-business/when-clothing-style-influences-cognitive-style.html#.WTmBucaZNBw) That old adage, “You only have one chance to make a first impression,” is true - and it is becoming more and more important as our lives become faster and faster paced. I wore these in the military and I wear them in the office. The stirrup style means I can wear them with any sock, pant or shoe style. If your shirt doesn’t need to be laundered, just slip the stirrup off and hang the shirt. Next time you wear it, slip the stirrup on and button up! The plastic grips on the clasps prevent damage to your shirts and you can adjust the strength of the grip by bending (ever so gently) the clasp piece with a set of plyers. These will also act as sock garters to keep your socks pulled up snuggly, preventing saggy socks and raw heels. To attach the stays, take one shirt stay and set the clasps on the shirt first. On the shirt, clip one clasp about a hands’ width forward of the shirt’s side seam and the other about a hands’ width behind the side seam. The side seam runs from your armpit to the bottom edge of the shirt. Using the ones I recommend above, you should now have a “Y” shape when you let the shirt stay hang down, the tail of the “Y” hanging along the outside edge of your thigh. Repeat attaching the remaining stay on the other side of the shirt. Once attached, pull firmly (not a jerk, but a tug) down on the clasps to make sure they are holding the shirt correctly. If they slip off, you can increase the grip by gently bending the arm as shown above. Now attach the bottom of the stay. With the stirrups, you slip them on your feet like a sock with the band resting in the arch of your foot. If using clasps, attach the clasp to the outside of the sock. Give those a firm tug. If they come off, adjust as needed to get a solid grip. Stand up. The stays should be pulling the shirt down, gathering any excess material toward the outside of your hips while making the front and back look smooth. If you don’t have any of that, maybe you don't have any tension! To set the tension (how hard it tugs the shirt) of the stay you need to for the buckle. On my recommended stays, there is a little metal buckle that grips the stay when flat and releases the stay when you lift it up. Some fancy styles have buttons, others have snap fittings. Move the stay tension buckle up or down until you find the stays are tugging comfortably on the shirt. I wear mine with enough tension that I can feel it lightly in my shoulders - you find what works for you through trial and error. The higher the tension, the “crisper” the shirt will look, but the more “unnatural” the shirt will feel. Also, if you go too high with the tension you risk having the clasps work loose no matter how much you bend the clasp for gripping strength. Too little and you might as well not wear the shirt stays…. Finally, put on your pants! Stand up and check that the stays are working. Bend to your left at the waist, then straighten up. Did the shirt go flat or did it just bunch up? If it bunched up, you need more tension. Sit down, stand up. Did the back of the shirt “retuck” itself? Good, you have it set right. So there you have it. The “secret” of sharply dressed professionals everywhere! You can use these on any tucked shirt and I promise you the difference is night and day. Oh, one last thing - if you wear an undershirt (which I highly suggest) tuck the undershirt into your underwear, then your dress shirt over your underwear inside your pants. I love writing. Writing is a definite passion of mine. I have a few publications I am quite proud of, ranging from “Letters to the Editor” in my college newspaper to a full e-book. My niche is generally in the realm of military veterans and their transition into civilian life; resumes, work, life, benefits, and so on. I am also a career, benefits, and life coach which leads me to do a lot of research and writing for my clients. I am now proud to be a writer on dadshideout.com’s new blog, “The Good, The Dad, and The Ugly,” so all my experience is finally being put to good use! With having typed hundreds of thousands of words (Have I typed a million words?) for business and pleasure, I have a pretty well established writing technique. I figured I would run through some of the things I do and use so you might be able to pick up and integrate something to make your writing easier! This first post will be about equipment - the physical stuff I hold or use when writing. I will explore software, environment, and other aspects in later posts. I want to stress that this is MY stuff that I like. You should not go and buy anything because I say so! You might not like my style or techniques. Still, it can be useful, as you can see if I have good ideas and then you can try them out to see what works best for you! So, on to writing equipment! I have two types of notebooks - the “carry with you anywhere” pocket version and the “writing at a table” size version. You also need a pen (or pencil). The trick with these is you need to train yourself to carry the pocket version like your wallet, keys, and cell phone. You need to have it with you when an idea strikes. I am certain that I will not remember my random “good ideas” and by writing them down I have a chance of developing them later. The table size version is for those time when I get tired of digital work or if using a digital device is not an option. Watching a show with the wife, going to one of my kids' friends birthday parties… It should be large enough for some serious writing or to make thought webs, sketches, and so on. For a writing implement, I prefer a pen. They are more durable in my pocket and less likely to be “useless” when I need them. I could spend an hour or more walking up and down the pen aisles at the local craft store, admiring and testing pens, looking for the perfect fell on paper, the perfect fit in my hand. Sometimes, though, you go with your tried and true. From my time as a combat civil engineer, I became partial to “write anywhere” pens, specifically Fisher Brand; pocket version and normal size. They write at any angle, and back when I was doing field work they are paired beautifully with the “Rite in the Rain” brand Notebooks I used. Honestly, I have considered having a “Rite in the Rain” Notebook and Fisher Pen in my shower! What, I get the best ideas in the shower, don’t you? I also use Bic pens (cheap, plentiful, easy to write with, no worries if they get lost of “borrowed”), so I am not a total pen snob! My buddy likes the thick lead mechanical pencils - whatever floats your boat! 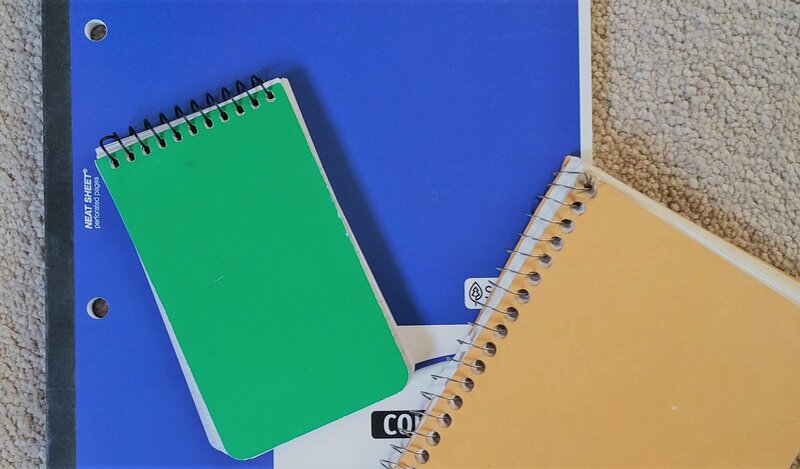 Notebooks are like pens, there are hundreds of types and you need to find what feels best to you. For the pocket version, I find that quality matters. With it being in a pocket and getting shuffled about day after day a cheap notebook is gonna disintegrate on you. Then again, when I started I used the bargain bin small spiral bound notebook with 30-50 pages. I happen to like “Moleskine” brand 3.5 x 5.5 Inch Ruled notebooks. There are plenty of other similar styles too. I have used these super thin notebooks by TWONE - they only have 30 sheets, but don’t take up any room at all. That makes them easy to carry around all the time. I have a tall single fold wallet and these will fit almost completely inside. For my “table size” version I go simple - 8x10.5 spiral bound notebook. These take far less of a beating, so I don’t spend much time or thought on these. I went with the tried and true once again. I go with a spiral bound 100-page notebook. It got me through high school, it got me through college, and I did all my research papers with these things, so why change what works? I like the larger size when I am bringing a backpack, a case or when working at home. I prefer the spiral style so I can fold it completely if I need the space, or if I am writing on my lap while on the couch! I love my Microsoft Surface 3. 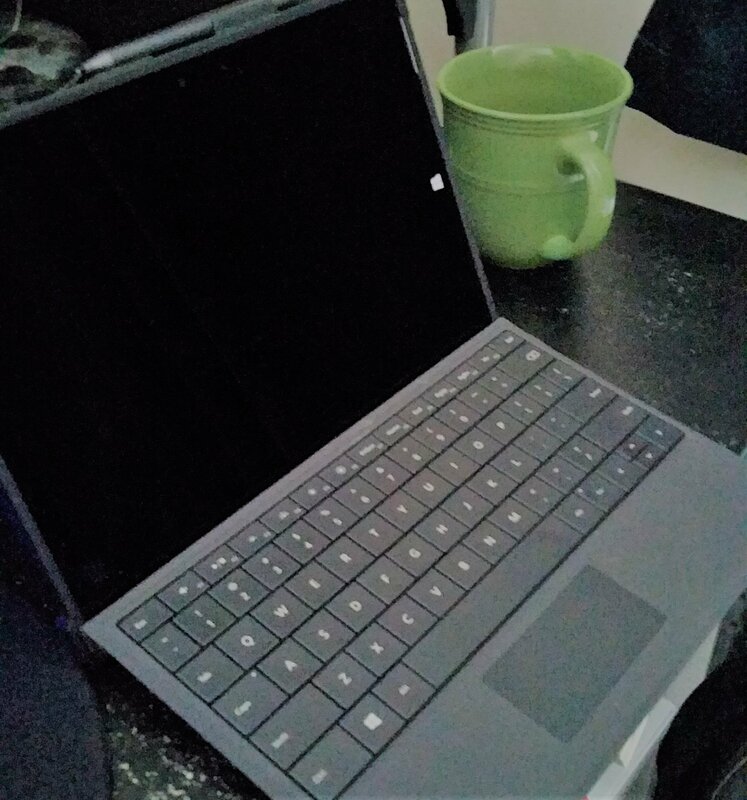 It is my primary tool for whenever I am working on a writing project, to include “The Good, the Dad, and The Ugly.” While the keyboard on my desktop is a little more comfortable for long sessions of writing, the Surface 3 holds the role as the “inspiration” and “first draft” tool. Once I tap out those first few hundred (or thousand) words, I take the data to my desktop for edits and polishing. The software interchangeability is nice, allowing me to work on the same software that I use on the desktop. This makes the workflow more streamlined; I don't have to spend time copy and pasting between systems and such. I transfer data between Surface and Desktop with a 64gb thumb-drive. I tried to use Microsoft OneDrive, but I found that taking the thumb-drive between computers worked better for me than making sure everything was synced up. If I am in a rush, I grab the thumb-drive; no need to turn on a computer, log on to the internet, and then sync. I use the thumb drive as a removable hard drive - save and load from it. If you are going to do work between multiple digital platforms, as I do, getting a system in place for transferring and tracking files is critical. Finally, the portability of the Surface makes the interchangeability useful. It is about the same size as a tablet. I have a case on mine to increase its durability - still comes in about half an inch thick. Battery life is great - way better than my laptop. I get 4-6 hours of full video playback off a full charge, and I can type for 8 plus hours on reasonable brightness. The Surface 3 charges using a micro USB, so I can use the same charger as my phone if I need to. I can boot it up really fast - sub 20 seconds - which means I can turn it off completely to save battery. All this adds up to a relatively powerful, very portable, enjoyable to use writing tool. You could also use a tablet with a Bluetooth keyboard or a regular laptop. I used my laptop previously, but I have found being able to bring the Surface with me to more places is more useful than being able to do more varied tasks on the laptop. When the workflow progresses beyond words and basic editing, I step up my game to something more robust. When all is said and done, I have way more equipment than I need. You could do everything on the Surface 3 and call it a day - I have and do from time to time. Still, when I am handling multiple projects, research, or online learning/teaching I need my dual monitor desktop. I became spoiled by multiple monitor setups during my time in the Air Force working as a Geo-spacial Engineer. The ability to put the main program on one screen and source material on the second was a godsend. No more alt-tabbing or manually clicking between views. 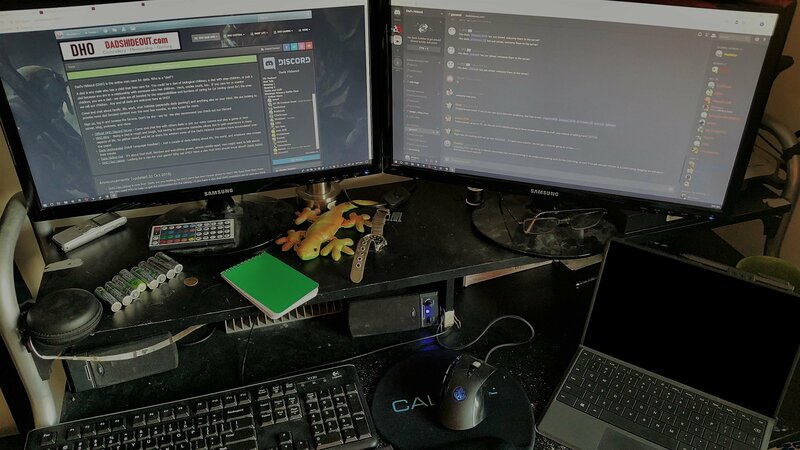 When writing, I find the same is true - dual monitors allow more information to be up at the same time and reduce time spent flipping through windows. The desktop also has the power to do full editing of audio, video, and much more. It has sufficient storage to keep everything centralized, but I have a backup drive… just in case! The best seat in my house (other than my recliner!) is my office desk chair which makes long sessions far more comfortable. I also have a keyboard I love and a speaker setup that allows me to play background music to keep my mind from getting too distracted by outside noise. I have been using this equipment setup for about the last year and a half. Before I purchased the Surface 3 (second hand, I might add. Save your money where you can, right, dads?) I used a laptop from college. It was a 2013 model but it did everything I needed for writing, and it could even run a second monitor! When I used the laptop my setup was two things; paper notebooks and the laptop. Now that I have a more workspace, the current setup rewards me with better overall results by splitting the laptop into two different machines better suited for particular purposes. The Surface fills the portability and “drafting” niche while the desktop fills the editing and finishing niche. I am sure over time my equipment will change again. I know that I need to add in a camera to my equipment, as taking my own high-quality images for use on the blogs is something I would like to do. Right now I get by using my cell phone, but that will only go so far. Still, why spend money on perfect, when good enough will do? So there you have it. The equipment I use to get the words from my head to your eyes. I will be following this up with the software I use and then the process I use to bring it all together. If you have equipment that you use when writing and would like to chime in, comment below! I would love to hear what you use to get those words on the page; I might even borrow some of your good ideas! What are you going to find on the blog? Anything and everything that dads overcome, think about, or struggle with. Dad's hobbies, passions, and fears. No topic is off limits as dads deal with everything life throws their way - and as a dad, we deal with OTHERS lives as well! The lives of our children, our significant others, our parents and our friends all influence a dad’s life, so we plan to explore all of these areas. We will touch on home improvement, career improvement, and life improvement! We will talk about leisure and work, success and failures, and everything in between. Also, please give @Airbornebob a round of applause for the name suggestion - he has won an Amazon Gift Certificate, the adoration and respect of his fellow dads (no guarantees on that) and, if he is willing, he will be the first dad interviewed for our "Get to Know DHO" feature as well! Thank you, Airbornebob for the suggestion, as your fellow dads thought it was the best out of twenty possible options. Stay tuned, as I have a bunch of articles in the pipeline and we are prepping other dads to contribute! If you would like to become a writer for 'The Good, The Dad, and The Ugly' or would like to do you own blog series here at DHO fill out an application here. Save Hundreds - Go LED! Dad, when was the last time you had to yell, “turn off the lights - your wasting electricity!” I am sure even the non-dads remember having this told to them! You don't hear this as often in my house as it's not entirely true anymore! You see, I upgraded to LED lights throughout the house, and I use 1/5 the energy I did before. My math says I will save between $70-100 in lighting costs each year - and the electricity meter is agreeing with me! The switch wasn’t cheap, let me tell you! Retail, all the LED “bulbs” were about $100. Luckily, I had a coupon and bought bulk so I spent only $50ish out of pocket. Still, the switch will save me money, even if I paid full retail. How? LED bulbs are so much more efficient than incandescent, halogen, or even fluorescent lighting. Remember those complaints about LED lighting being so “bright and cold”? How you can only get that “warm” color from incandescent or halogen? That is no longer the case at all… in fact you can choose different light warm depending on your needs. Should You Switch to LED? Short answer, yes. As in all things, the devil is in the details though! When should you switch, how much should you replace, and is it a cost-effective choice? Let's dive into these using my house as an example. Let's go over some electrical terms - a kilowatt is a way of measuring the amount of electricity used. Each electrical device you own has a wattage rating -your cellphone charger, your computer, every light in your home. A 100 watt light bulb uses 100 watts of electricity to work. Your cell phone charger is likely 5 watts. A common laptop might be 35-60 watts while a full gaming computer with multiple screens and sound system could run 400-600 watts or more! Your electrical company charges you by the kilowatt-hour - kWh. A kilowatt-hour means using 1000 watts for one our of time. If you have 1000 watts of electrical devices running for 1 hour, you use 1 kWh of energy. You can also use 1 kWh by using a100 watt device for 10 hours. Take a 100 watt incandescent light bulb; if you left one on in the garage overnight (let's say 10 hours) that light would use 1 kilowatt-hour of electricity! How expensive if a kilowatt hour? The cost of electricity is dependent on where you live. The average in the United States is about 13 cents per kilowatt-hour. Where I live it is 17 cents per hour. Hawaii is the most expensive at 26 cents per kWh and Louisiana is the cheapest at 8 cents per kWh. Check your local costs when you decide if LED makes sense for you! For this post, we will go with 17 cents an hour for my house. In the case of leaving a 100 watt light on overnight, it would cost me 17 cents on my electricity bill. 17 cents doesn’t seem like much, but what if it is a front entrance light? That could run every night for 10 hours - $5.10 out of my pocket to keep that lamp running for a month, or $62 bucks for the year. The question is - should I replace the light bulb? LED lamps are not cheap - at least not compared to buying an incandescent light bulb. You can purchase a 100w incandescent light bulb for a dollar. An equivalent LED can be between $3 - $10! We need to consider lifespan, though! The dollar store bulb might last +/- 2000 hours. If the outdoor lamp we mentioned lasts for 3000 hours, it will need replacing once a year. LED Bulbs are often rated at 35,000 to 50,000 hours! To be fair, LED is a newer technology, but reports so far are indicating that even the early LED bulbs sold a few years ago would reach 20 thousand hours of life. Based on this, it is reasonable to say an LED will last 10 times as long as the incandescent lamp. If we look at the replacement costs alone, the LED is at least as cost-effective compared to the incandescent - $1 a year for incandescent and $1 a year for the LED! The real savings (aka: the place where you will notice it the most) is potential electrical savings. Let's look at that! Incandescent light bulbs became so universal that many people refer to “brightness” or “amount of light” by the wattage rating of an incandescent light bulb. If I ask you to imagine a room lit by a 100 w bulb and them imagine that same room lit by a 40 watt bulb, you probably can do that easily. What if I asked you to imagine a room lit by 1100 lumens? That would be like a 75w incandescent light bulb - and suddenly you can see that room, can’t you? How many watts does a similar lumen LED use? That's the question - and the answer is 1/6 to 1/5 of the incandescent. Back to that entrance light - Remember how it runs for 10 hours a day, for 17 cents a day, for $62 a year? If I switch to an LED of similar illumination the electricity would cost me just $9.30. Even if the bulb cost me $10 to replace, I would save nearly $43! I would save $54 the next year (as the LED would still be working and I didn’t have to buy a new incandescent bulb). If the LED only last 5 years (and it seems likely the bulb should last 10 years!) that one LED replacement would save approximately $250 in electricity. For those who hate math, use this map - find your state and assume your lighting requirements are the ones listed here. As an example: In my house, the kitchen is used for making breakfast and dinner at least 5 days a week (approx 260 days a year). Breakfast takes about 30 minutes and dinner takes about an hour and then another 30 minutes for washing dishes or whatever. So each day the kitchen has its lights on for 2 hours. It has six 34 watt halogen spotlights. That room will use 0.4 kilowatts (~7 cents a day) each day based on my estimate. If I switch to LEDs, each lamp will be 6watts - 0.07 kilowatts (~1 cent a day). I could save about $15 a year by switching the kitchen to LED spotlights. Beware! Math! .4 kWh * 260 days = 104 kWh * 17 cents per kWh = $17.68 vs. $3.10 = .07 * 260 *.17. $14.58 savings per year. If I can find replacement bulbs for about $15 (which I was able to do!) I will see the money back in a year then save $30 over the next two years. If we use the kitchen lights more than 2 hours a day (and I suspect we do… turn the light off, kids! )then the savings are even more. Repeat the math for each room to get a handle on your energy usage. Easy - take the number of kilowatt hours you use on lighting and divide by 5 - that is what you would use if you had all LED lamps. Multiply your kilowatt-hour usage buy you cost per kilowatt to see your cost - compare the two to see your savings! All at once or once for all? Should you replace all your lights for LEDs today? The long-term answer is yes! Switching now will reap the biggest rewards over time. Yet, the long answer is most likely not, as replace every bulb in your house today will cost a significant chunk of cash up front. If you are not convinced to replace EVERY bulb, I would suggest identifying the most used and highest wattage lamps and replacing those first. Also, consider replacing in batches - replace all the 100W incandescents first and buy a pack of those LED replacements. The bulk purchase will help save you money, and getting rid of the 100w energy suckers will reap the largest rewards. Then find the lights used most often - in my home it is the living room, the office, the kitchen, the kids' room, and the main bathroom. Replace those as you can when you can. Finally, replace the less used places when (and if) the bulbs burn out. This would allow you to find savings early and spread out the cost over time. When should I replace my bulbs? Good news, everyone! The cost for LED bulbs is continuing to decrease, so for many of you, just wait until the bulb you have dies - then replace it with an LED equivalent - and the price of the LED replacement will most likely have dropped a little bit more. When you do buy, I would recommend you buy in bulk - you can get significant savings buying a pack of LEDs vs. buying each replacement separately. I save 50% buying in bulk and that is why I did the whole house in one fell swoop. Also, consider that electrical prices tend to rise over time. As the price of electricity goes up the cost savings for LEDs does too. So watch your bill and that might tell you when to switch! A few quick considerations: When you buy LED bulbs consider the “warmth” of light. Incandescent and halogen lights are known for their “warm” light - it has a lot of red and orange hues. Florescent light is often called “cold” - it has a lot of “blue” and appears very “white.” Early LED bulbs were VERY “white” and this could make a room feel “wrong.” I purchased “warm” LED lamps and they emit a light that matches an incandescent bulb. You cannot tell that I switched the bulbs when I used the “warm” LEDs. If you are replacing lights that are attached to a dimmer, you will need dimmable LEDs, which are generally a little more expensive than a non-dimmable version; an extra dollar or two per bulb. By dimming a light, you use less energy. If you are using a dimmer to keep the lights low, you may consider delaying replacing those with LEDs as dimmed lights are costing you less making the cost vs benefit less favorable for the replacement. Finally, test out an LED bulb in a reading lamp for a few days before you go and replace everything in the house. Some LED designs can flicker. This flicker is “imperceptible” to most people, but through one of my lines of work, we discovered that certain brands of LED and most types of fluorescent lamps induced headaches or migraines in military veterans with traumatic brain injuries. Other people may be susceptible as well. So try out a bulb first to see if it works for you, and then you can buy with confidence! How did it work out in my house? Well, I switched everything out! I was able to find bulk packs for each of the types I needed - two six packs for the halogen spotlights, two five packs for the 40 halogens, and a five pack for the 60w bulbs. I took the 5th bulb from that last pack and used it in place of the 100w in my garage. If my kids decided to turn on every lamp in the house I no longer use 1.1 kilowatts - now my whole house lighting system draws only ~ 200w! In the end, I should see between $70 and $100 dollars less in electricity over a year. It’s not huge - but it will pay for the bulbs in one year, and then save me money the next two; plus I have a little insurance in case the electrical rates go up, as well! All in all, I feel good about moving from the old way to the new way. I know that I am saving money, I was able to teach my kids about energy usage and a little science while I was at it, and the idea of not changing another light bulb for 3-5 years (maybe 10 years!) is quite nice! DHO Goes Blogging! CONTEST INSIDE! We have been teasing about new things coming to DHO - and here is one! DHO now has an official blog! However, every good blog needs a name, so, to make it fun we will be accepting all reasonable names ("Bloggy McBlogger Blog" has already been submitted...and will not be the name, sorry dads!) and putting them on the forum for a vote. The winning title will become the new name of the DHO Blog AND the person suggesting the name will be featured as our first "Get to Know DHO" blog feature AND will win an Amazon Gift certificate AND will be adored and congratulated by all dads everywhere for all time (no guarantees on the last item!) Submit your Name Ideas here! We are also accepting applications for authors to add to the blog! Please go here (click here!) and follow the forum post to submit to be a DHO blogger. Don't wanna commit to anything but have a good idea for a post? If you just want to do a single article, that's awesome! We will be happy to host you for a one-off article! Have an idea, but don't wanna write it? Feel free to suggest the idea and our writing dads will add it to our ideas list! Thanks again to all our Patreon Supporters - it is through their donations that we are able to add this element to the DHO website. We hope that you find it enjoyable and informative (plus a little fun!) and another reason that you are proud to be DHO! There is a local association of homeschooling parents here, that puts together special events and field trips catered for the homeschooling child. We have dances, go to sporting events, plays, museums, and other local events. It's a great way to get the kids together and for us parents to share experience and problems. Not to mention, that a network of parents, similar to a PTA, is beneficial when it comes time to look for new curriculum for the next year, we have a lending library that is totally free, or at least very reduced prices on books and teaching aids. Great comments, and I totally agree. Here in Tennessee there are various methods and options to choose from. Our church sponsors a great series of classes for the middle school and high school age kids specifically designed for math, history, and science. There are online seminar formatted classes available also, along with a plethora of other formats. Your description of the time management aspect is the largest benefit for us as homeschool parents. As we work with the guidelines established with the state (180 days, with 4 hours a day) we tailor the schedule with many events and family activities. Standardized testing here is required after 5th grade, so we have one more year before move to that challenge, but like you mentioned, one light bulb to light is a lot easier to teach to than 25+! Gillette can lick my bum crack. Gj @Juggernaut41, bring everything back to tanks. Men are not under attack...except for @Cpl_Maida.